With respect to the number of colonies, Turkey actually ranks first among the honey producing countries in the world. But in regards to the number of hives to production ratio, China is ranked number one with 22%. India is ranked second with 14%, and Turkey is ranked third with 8%. 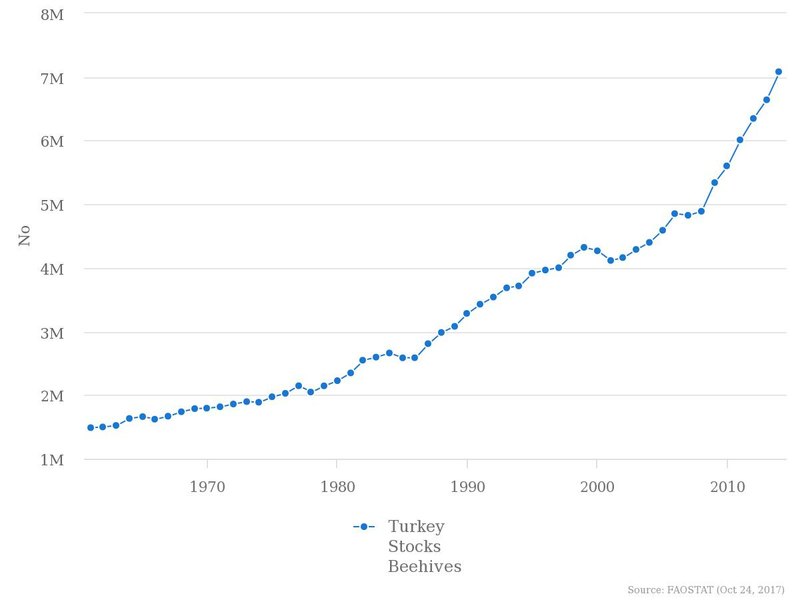 Although the number of beehives and production levels in Turkey are increasing steadily, average honey production per hive changes between 14-17 kilograms, and this figure is under world average of 20 kg. Every beekeeper in Turkey who has at least 30 colonies has to register to their city’s Beekeepers Association, and %98 of beekeepers are registered to the Turkish Beekeepers Association. All associations in the 81 Turkish provinces are managed by the Central Beekeeping Association in Ankara. As a member of the Association, beekeepers are automatically insured for all colonies, especially against transportation accidents in migratory beekeeping activities. They may also send honey bee samples to The Agriculture Administry Apiculture Research Ins. and Hacettepe University for laboratory analysis (diagnosis diseases or chemical analysis, pollen analysis of honey) for free. By being a member of the Association, beekeepers can take a loan from The Agricultural Bank of the Republic of Turkey (TCZB) for developing apiaries for colonies, and can also join seminars and education courses organized by the Association. Beekeeping activities in Turkey are supported by different institutions of the State. The first one is the Ministry of Food, Agriculture and Livestock. Under the condition that beekeepers register in the beekeeping recording system in Turkey, and that they have 30 full beehives, 10 TL (€2,2) payments per full beehive are paid to the producers who are members of the Beekeeping Association. In addition, 60TL (€13,6) per colony is provided to the beekeepers having bumblebees and being registered with the greenhouse recording system to ensure natural pollination in greenhouses. 40TL (€9,1) is provided per beehive for developing and protecting the gene-pool. Also, the amount of supports given for organic beekeeping is 5 TL (€1,1) per full beehive. These supports are provided by the Ministry of Food, Agriculture and Livestock. The Ministry of Forests and Water Affairs is also responsible for regulating beekeeping issues carried out in forests or forest related areas like grasslands. The General Directorate of Forestry is the main unit under The Ministry of Forest regarding beekeeping issues. If beekeepers want to keep their beehives inside or close to forests, they need to have permissions from this unit. This is also the case for National Parks. The beekeeping activities in Turkey are also supported by Agriculture and Rural Development Support Agency (IPARD Instrument for Pre-Accession Assistance on Rural Development). The provision of consultancy services, which is required for feasibility studies, the purchase of essential machinery and equipment, and modernization of enterprises for producing, storing and processing of the beehive, honey and other bee products, are in the scope of support. For this purpose, 50% of the spending from €5000 to €250000 is given in the form of grants. Beekeeping loans are given to the producers who have registered with Agricultural Bank of the Republic of Turkey (TCZB) beekeeping registration system, and have produced using at least 50 full beehives or have been willing to increase the number of full beehives to 50 and more. Organic Agriculture Law regulates the organic honey production and almost all regulations are in conformity with the EU norms. Turkey’s organic honey production is very small, however interest in organic beekeeping has increased in recent years.